Today I took Rory out for his first Harvard adventure. As I printed Rory at work at MIT he’s seen a little of that campus. 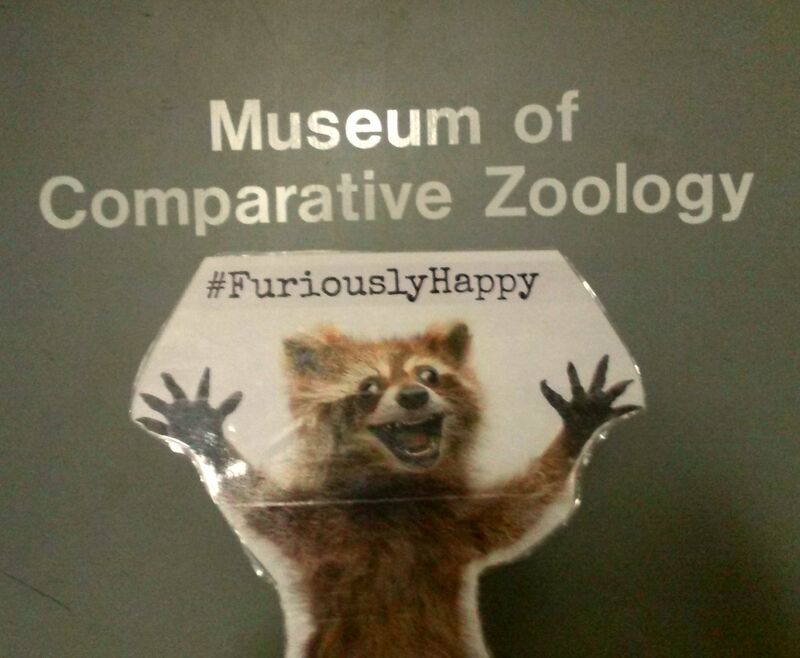 Tuesday, after I finished work at Harvard, Rory had a chance to see some of the, erm, flora and fauna of HMNH. Ok, less flora and more fauna. The flora will come another day. Rory got to enter via the back with me as befit his internet stardom. That and it was raining and the main stairwell was PACKED with people. The downstairs door to the MCZ or the Museum of Comparative Zoology. 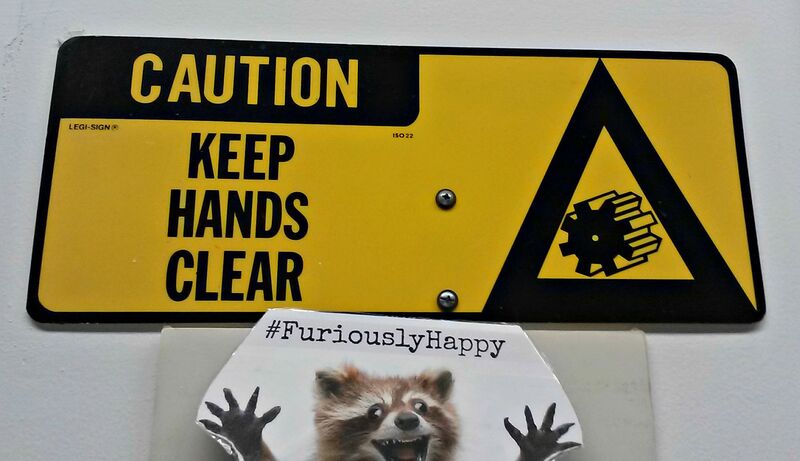 We passed this sign in the hall. It was on a rock prep room. I can understand the warning, if they have tools in there that can cut rocks I imagine they can do all sorts of damage to humans. Or wee raccoons. Rory is obeying the sign. We started our journey in the room filled with the shiny stuff. 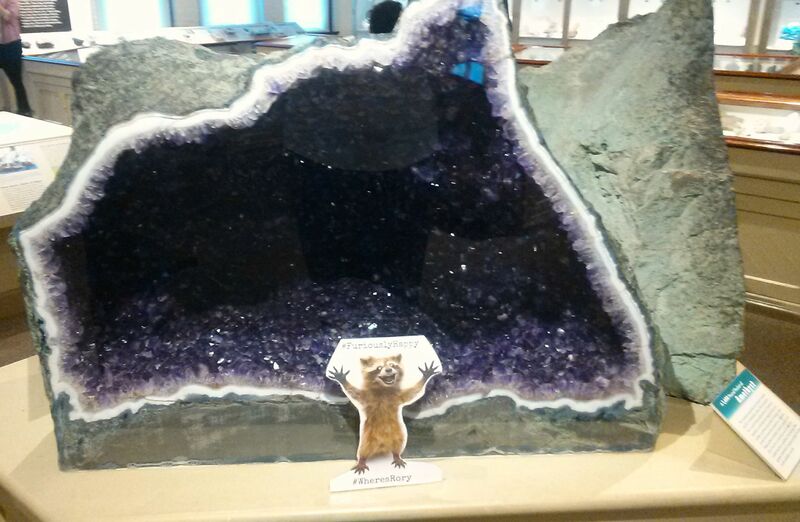 Rory got his picture taken with our famous 1,600 pound amethyst geode. Rory is standing in front of half of it. The other half is to the right. The front of the geode has a custom fit plexi cover to keep out trash, prying fingers, small children, and Rory. 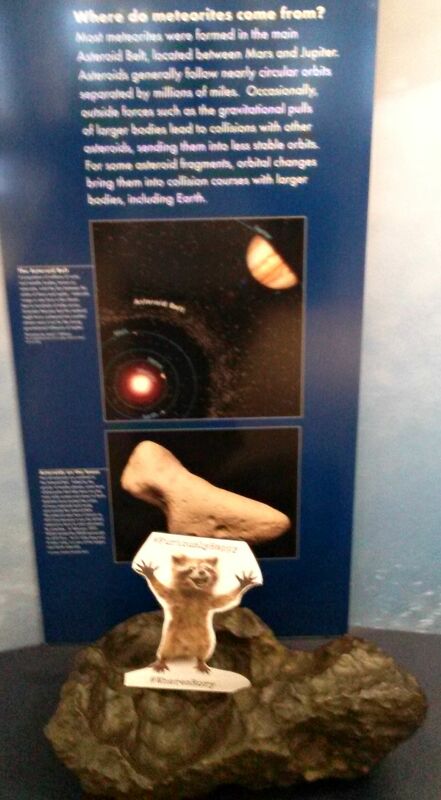 A lot of people think meteorites are rocks. They’re usually metal. Like this big one here. 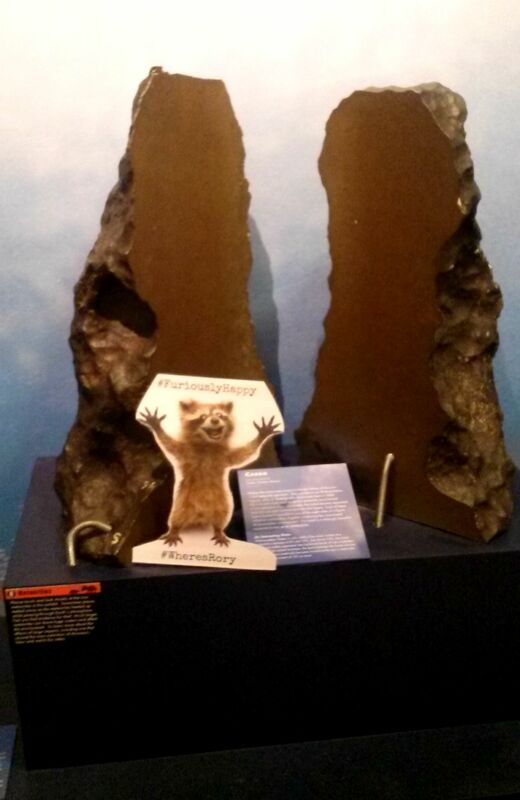 It may look like Rory is standing on a giant turd but that’s a real meteorite. From space. 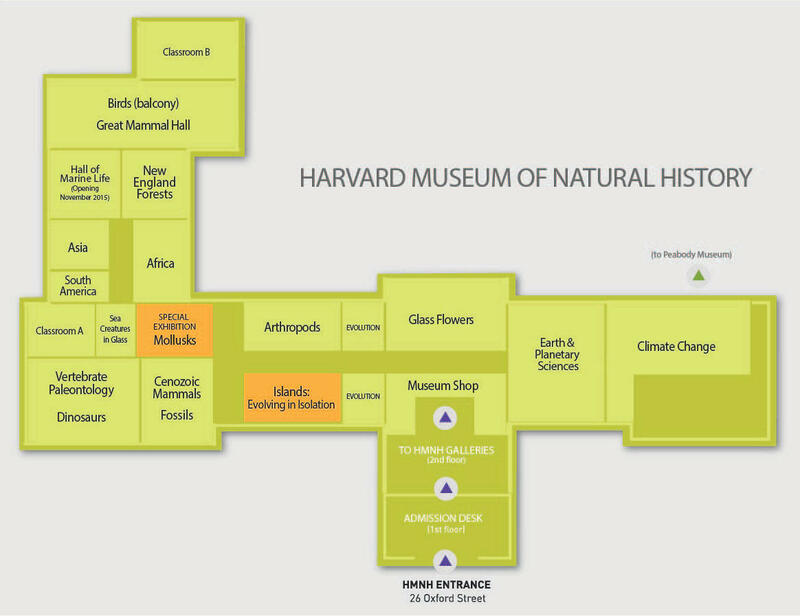 This is what the museum map looks like. Everything from Evolution on over to the left is part of the MCZ. As I took somewhere north of 30 pictures I think I’m going to split this up into a couple of posts. After all, there were a LOT of animals for Rory to see. First up were the fossils in Romer Hall. 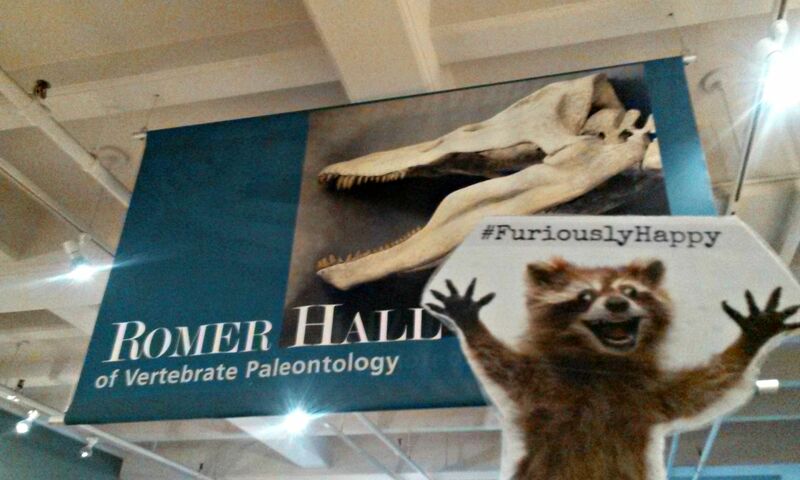 Welcome to the Romer Hall of Vertebrate Paleontology! As I was taking this photo a woman offered to help and then enthusiastically asked if I had Flat Stanley. When she walked around next to me and got a look at Rory she got a really puzzled look on her face and then walked away. This is a really, really big shell. 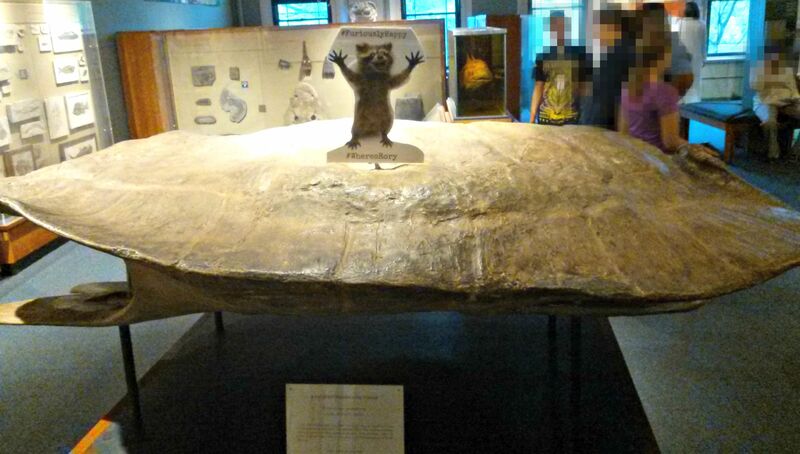 This is a fiberglass repro of a really, really large prehistoric turtle shell. It’s so large that it can fit a couple of kids inside. Comfortably. I think it’s bigger than my first apartment. It requires a steel frame to hold it together. That big. 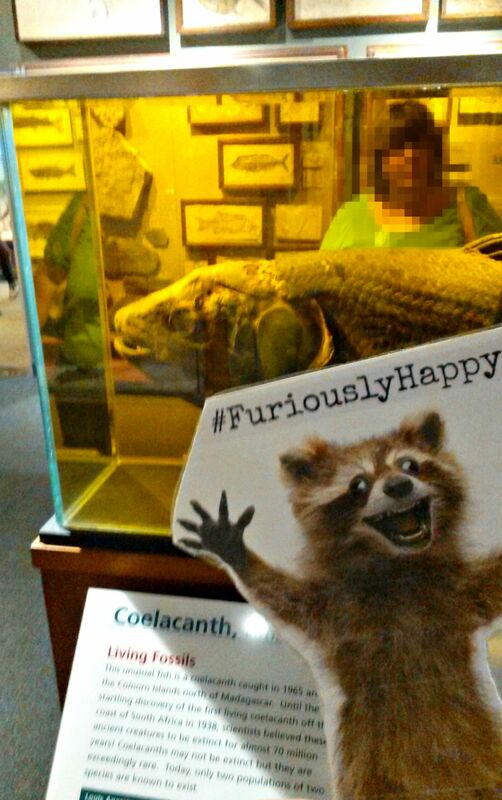 Coelacanths are big, scary, ugly living fossils. The one in our collection is preserved in liquid and looks like something out of a nightmare. Clearly this didn’t faze Rory. The HMNH mascot, the Kronosaurus. This is a pretty cool fossil. What’s even cooler is that, while prehistoric, it’s NOT a dinosaur. It’s just really, really awesome. Clearly Rory agrees. Moving from Romer Hall to the Cenozoic Mammal hall, we come to two of the coolest mammals in our non-taxidermied collection. 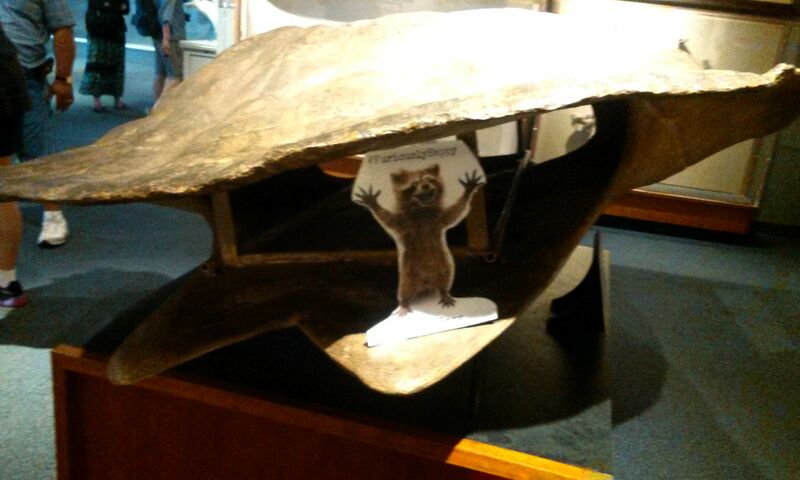 This is the Harvard Mastodon. The story of the Harvard Mastodon’s acquisition involves murder most foul. It’s also a really cool story. Totally worth seeing. 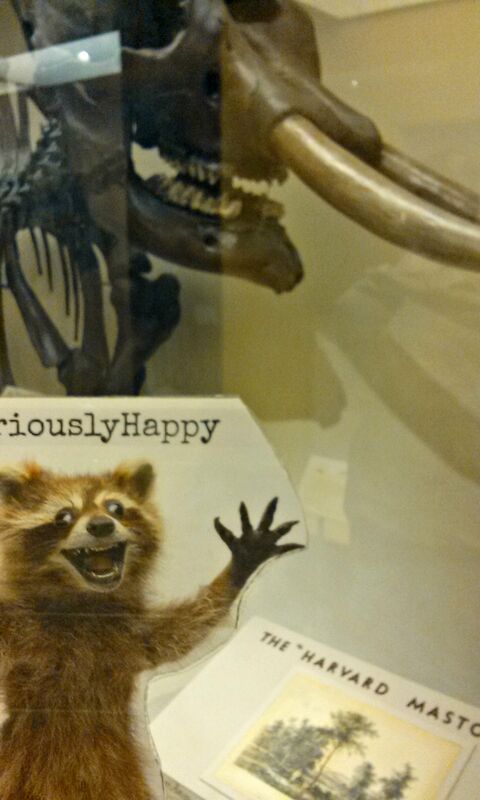 Next up, my favorite terrestrial mammal skeleton. 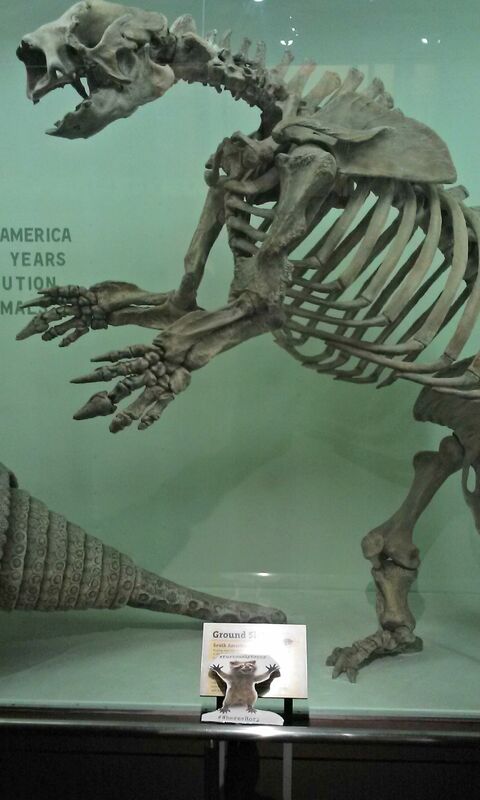 That’s Rory with a Giant Ground Sloth. REALLY. It’s about 10 feet tall. I’ll leave you with that for today. 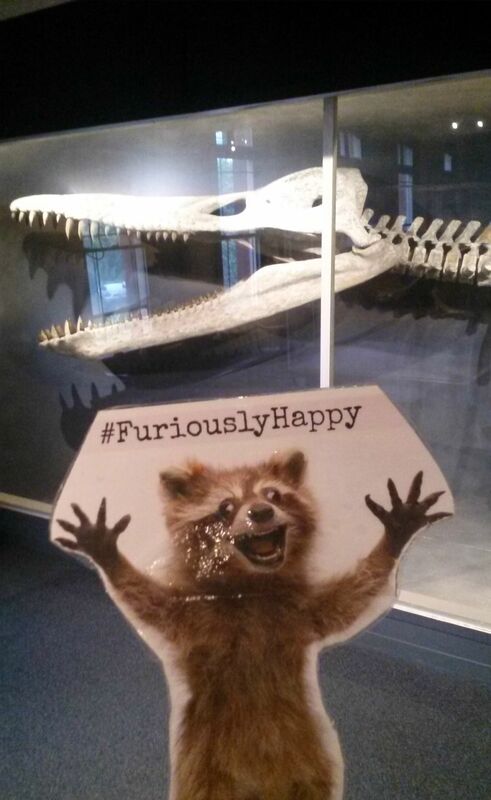 There will be more photos with Rory’s tour of the taxidermy collection and some visits from some special guests. You see, I never read Flat Stanley, so I really know nothing about him. Rory, however, is a companion of The Bloggess who is something of a personal hero to me and my husband. He’s also a nice combo of frightening and adorable. Rory is pretty cute, though. I’ve seen photos on The Bloggess website of him turning up in all four corners of the world. He gets about a bit, doesn’t he?